If you haven’t heard of Kobo, you’d be forgiven. Despire being around for years, it’s lurked mostly in the shadow of Amazon’s hardware. Available September 6th, the Aura One is completely waterproof for up to 60 minutes 2 meters of water. So forget reading by the pool—you can read in the pool. It’s surprisingly thin and light, coming in at just 6.9mm thick and 0.5 pounds. Kobo says the slightly sized up display helps mimic the feel of a more spacious hardcover book. The Aura One also battles sleepless nights with a feature that can detect surrounding ambient light and adjust brightness. If you set a bed time, it slowly hues to yellow as the sun sets. It’s basically the same as Apple’s Night Shift. Amazon’s latest and greatest Kindle Oasis doesn’t have it at all. Perhaps the coolest feature is that the Aura One is seamlessly integrated with book-lending service OverDrive. In short, the service lets you borrow books from your local library. Sure selection is limited, and there’s a limited lending period, but if you find something you like, free book beats the hell out of paying $9.99 to Amazon. Other than that, the Aura One essentially handles like a plain and simple e-reader. Even though it offers more features than Amazon’s Kindle, it’s hard to go toe-to-toe with Amazon’s selection of titles, so Kobo seems to be bringing the fight to price. 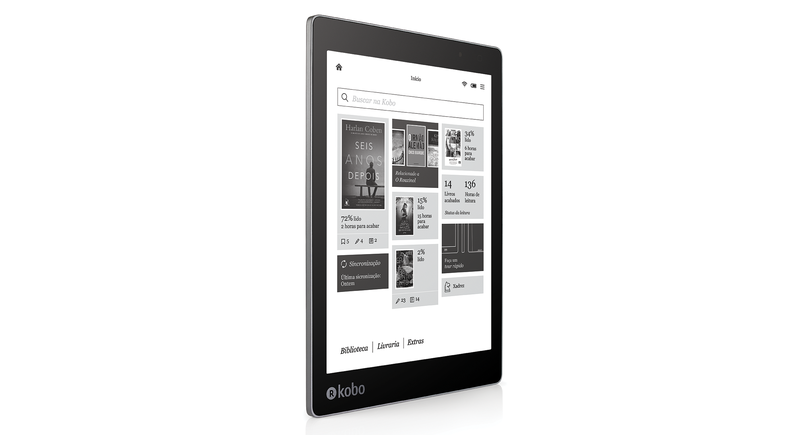 Where the Oasis costs $290, the new Kobo goes for a slightly more affordable $230. Although it doesn’t completely win the war with Amazon’s very good Paperwhite, which costs just $100.